Given the commercial success of the 2005 film Madagascar, it should come as no surprise that it received a 2008 sequel, not to mention an animated spin-off television program starring the penguin characters from the motion picture. Nor is it a surprise that the film’s universe became the setting for several video games, including the 2005 Nintendo Gamecube title based on the original movie. Today, we’ll take a look at this surprisingly better than average kids move to video game adaptation. 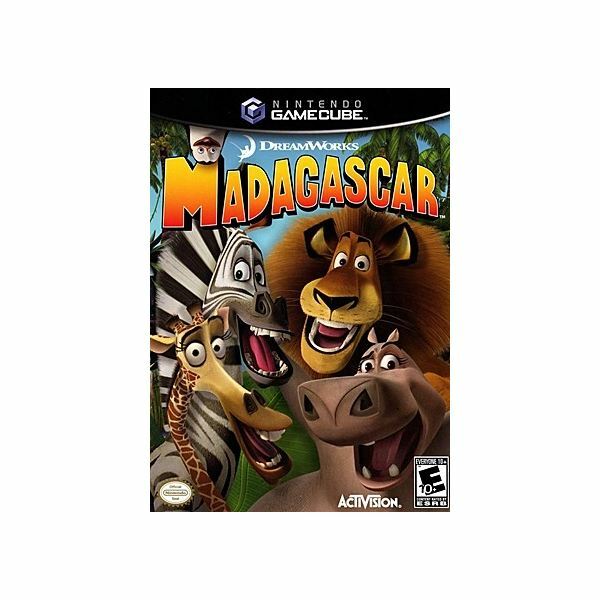 The game is based on the events of the first Madagascar movies, with a few necessary liberties taken in order to successfully make the transition into the realm of gaming. The game starts with Marty the Zebra wandering around his home, the Central Park Zoo, on his birthday. Bored of his surroundings, he teams up with the leader of a squad of highly trained military penguins to break out and find a way into the wild. His friends, Alex the Lion, Gloria the Hippo and Melman the Giraffe, follow suit in an attempt to stop him. The quartet winds up getting captured by authorities and sent on a ship to a wildlife reserve in Kenya. However, the penguins intervene again, hijacking the boat and causing it to crash land, where else, in Madagascar. The game succeeds in being every bit as charming as the original movie — if you liked one, you’ll like the other. The writing is sharp and clever, and it zings plenty of one-liners that will leave you chuckling, no matter how old you are. The Madagascar game features a bunch of different gameplay styles all rolled up into one. You control all of the four main characters, Alex, Marty, Gloria and Melman, as well as the penguins and some other characters from the movie during different levels, along the way. In addition to the standard platform-style running, jumping and item collecting you might expect from a game like this, there are stealth action levels, timed racing challenges and tons of minigames such as minigolf, shuffleboard, a lemur dance party, and even a tank-shooter reminiscent of the old-school Atari 2600 title Combat (for those of us who are old enough to remember that one from your childhood). Controls are solid on the whole, though I can’t help but wonder if some of the puzzles and obstacles won’t be too challenging for younger gamers, particularly when it comes to sneaking around and avoiding zoo guards, or some of the timed levels featuring Gloria, which are very fast and can be difficult to control. On the plus side, you can use the coins collected during gameplay to purchase character upgrades, minigames and more. On the other hand, even with all the extras available, the game is rather short, even with the inclusion of couple of annoying fetch quests. All told, I don’t expect it taking more than 4-6 hours for the average gamer to finish it. The graphics are pretty average for a Gamecube-era title based off of a kids movie, which means they’re not quite up to par when compared to most other games. There are some fairly detailed environments, some nice waterfall effects and things of that nature, but most of the time and effort seems to have gone to rendering the characters and making them visually appealing to Madagascar fans. Music is OK, but again, nothing too special. I do have to applaud the game for its voice over work, however. There is a ton of spoken dialogue in the game, and the actors they hired for the game do an excellent job sounding like Ben Stiller, Chris Rock, Sasha Baron Cohen and the rest of the film’s original cast. It was an impressive effort on the whole, helping to raise Madagascar’s production levels higher than what one would expect from a game of this variety. While Madagascar is an incredibly short game, it at least managed to remain entertaining throughout, thanks largely to some clever humor, sharp writing and some nicely varied gameplay. The levels that required players to sneak around and use their heads to get past obstacles and advance were especially nice, those being Marty’s escape from the zoo and the one in which the penguins took over the ship. Sadly, the length keeps this from being a recommended purchase, but it certainly is worth a rental, especially for folks who enjoyed the Madagascar films, or have children who do.